Raised garden beds are popular among gardeners who want a bit more control over their plantings and want a more organized layout. We will share some of the reasons why, the simple steps on how to build a raised garden bed, as well as some of the supplies you’ll need to build your own. The material you use will depend on your budget, what’s readily available in your area, and your personal preference. You have many materials at your disposal, from concrete blocks and recycled bricks to cedar and pressure-treated pine. Many gardeners prefer to go with pressure-treated pine, as it’s inexpensive, rot-resistant and safe for all edible plantings, says the Iowa Gardener. You only need to really raise your garden beds between four and six inches high, but some people have been known to get as high as 24 inches. This is usually due to personal preference, so they don’t have to bend over very far, plus deeper depths are ideal for vegetables that need more space to grow, such as carrots and potatoes. No matter the depth, make sure you anchor them well with stakes or bury a couple inches of edging material into the ground. 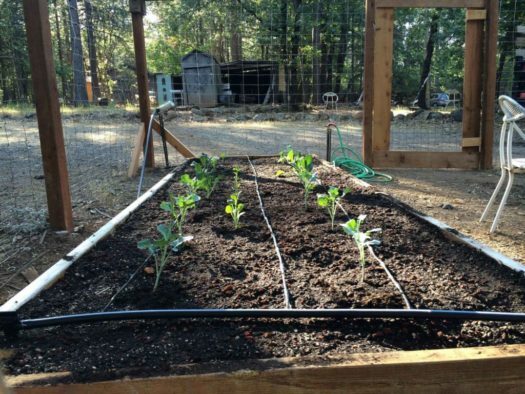 The soil you use will make or break the success of your raised garden bed. Many experts recommend a combination of half topsoil and half compost. Get it from a garden center and ask to open the bag and take a sniff. It shouldn’t have any foul odors and it should be dark, moist and crumbly. If you find you’ll need more than 12 bags, buy in bulk from your local landscaper or nursery. From there, you can proceed with planting as you normally would. If you have a low bed of just a few inches, make sure you incorporate plenty of compost, peat moss, or sand in the base for the best results. One note: you don’t need to put down any landscape fabric at the base, as the many inches of soil on top will prevent weeds from growing. Once you have your garden under control, you may be thinking about the exterior of your home, such as roofs and gutters. Home Solutions of Iowa can install seamless gutter systems for your home at a price you can afford. My neighbors have LeafGuard® and are very happy with it so I knew I had to get it. They did a wonderful job. - Ross W.
The project was explained to us well, they were very professional, and we are really happy with the end product. - Ronelle I.
I was impressed with the speed of the job and the openness of communication. - Ron P.